Product prices and availability are accurate as of 2019-04-02 15:57:58 EDT and are subject to change. Any price and availability information displayed on http://www.amazon.com/ at the time of purchase will apply to the purchase of this product. 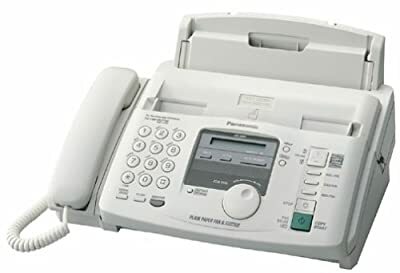 Save valuable desktop space with the compact Panasonic KX-FP81 plain-paper fax with enhanced copying functions. It can make up to 50 copies of any transmittable document and zoom to 200 percent. The KX-FP81 accepts a variety of paper sizes including letter, legal (with optional legal tray), and A4. A 50-page paper tray and 10-sheet document feeder provide smooth transmission with minimal paper refills. If you do run out of paper while faxing, the KX-FP81 will use its 28-page document memory. You can also print reports for confirmation that your documents have been sent. A convenient help button allows you to print quick reference guides on various fax functions such as setting the date/time, explaining error messages, and problems in general. A rotating dial lets you easily select from these and other options and also save names and numbers in a directory. You can store up to 50 numbers and dial them automatically. The KX-FP81 can also be used as a fully functioning phone and includes an interface for your external answering machine.